It’s time for Delphiniums. Photo courtesy of Sunnyside Nursery. Their tall stature often anchors the back of a bed and provides the height that is so critical in keeping the eye moving through a perennial landscape design. When I moved to the northwest 30 plus years ago, I couldn’t wait to grow these beauties. 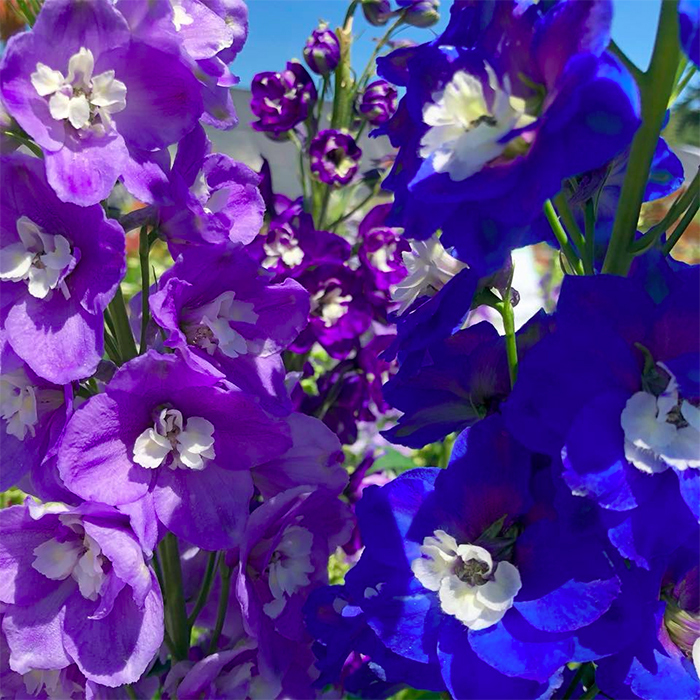 You see, growing up in southern California (only 15 miles from the Mexican border), the weather was not conducive to many perennials, like Delphiniums, because there was no distinct winter to force them into dormancy, so they just kept growing and getting leggier and leggier. For perennials to do their best, they really need to rest for several months and that just doesn’t happen in southern California. In the northwest however, we have the perfect climate for growing perennials, like Delphiniums and a whole host of other fabulous perennials that can easily provide us with nine to ten months of non-stop color. This is accomplished by planting early, mid, and late bloomers and combining them so that there is a constant succession of flowers throughout the entire season. While most perennials only bloom for five to six weeks, Delphiniums are special in that after their initial bloom in early spring, if they are cut back and fertilized, they will re-bloom again in September. Talk about bang for your buck. You can find Delphiniums in the garden center this time of year in many varieties and often already budded up and showing color. Gallon sized plants will have multiple stems, while four inch starts will only have one stem and will need another year to really get established. Plant them in full sun and don’t forget to stake them before a rain or windstorm knocks them down. As a side note, sometimes Delphiniums are labeled as larkspur, so don’t get confused - true larkspurs are annuals and are much smaller in stature. Despite all of the new introductions, my favorite is still one called “Black Knight,” which has dark midnight violet blossoms and can reach five to six feet tall in the garden. “Green Twist” from the New Millennium series is a brand new one that caught my eye the other day. It has large white flowers tinged green, with a white and green bee - often double or semi-double. The stems are sturdy reaching four to five feet tall and are great for arrangements. One other series that I am impressed with is the Guardian strains. They only grow to about three feet tall, which is perfect for smaller gardens, but the flowers are large and double as well. Colors are white to shades of lavender and blue. All delphiniums will attract hummingbirds and other pollinators, like butterflies and bees, and they are deer resistant. Slugs can be a problem in early spring when the new growth is emerging, but after that they seem to be just fine. Feed them with a balanced organic flower food, give them lots of compost and they should be happy campers. If you can’t get them to live more than a couple of years, chances are they are staying too wet. Now is the time to shop for delphiniums, once they are gone the nurseries won’t have them again until next year and they are too wonderful to miss! Sunnyside will be hosting a free event, “Carrots, Candy & Kids,” on April 20, 2019, from 10:00 am to 4:00 pm. For more information visit www.sunnysidenursery.net/events.